This kid-friendly football game offers different levels of difficulty for up to two players in pickup and season modes. Practice mode is best way to learn the simple plays and cool offensive moves. Player can choose among scenarios with off vs. defense (and vice versa), kickoffs, and kickoff coverage to get past that initial learning curve. 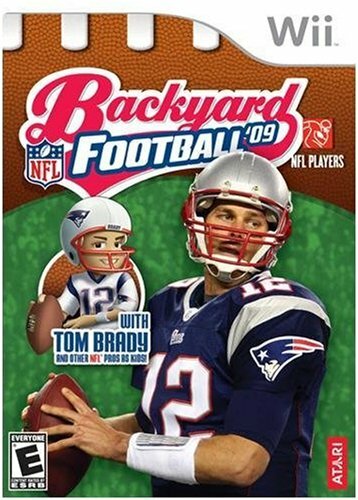 Tom Brady is the main NFL kid star along with 22 Backyard kids, including Captain Concussion and fun-loving twins. Other pro players include Brady’s current nemesis Peyton Manning, LaDainian Tomlinson, Reggie Bush, Brian Urlacher, Vince Young, and Michael Strahan (complete with front tooth gap). Kickers have incredibly long ranges too, so don’t feel bad about settling for three. Create a customized player through an easy navigation format, which includes choice of hairstyle, voice and other options. Audio introductions describe each default player (which also would have been nice for other Backyard console games) so young players can choose wisely. Each player has their own special mix of talents, so pay attention to the other team’s choices for an ideal matchup. Custom teams can also be created while the main cache predictably includes all NFL teams plus 10 Backyard teams. Ordering the teams by division has a nice touch and can teach younger generations even more NFL knowledge. This game could also use more music beyond the nifty new theme, written and performed by Chris Ballew from the rock group Presidents of the United States of America. Players choose from a simple base of plays, including clock plays when time is running down, but the button choice needs improvement. Stretching your thumb down to the 1 or 2 button isn’t the best arrangement, but the arrangement of the power move (c button) works well. Directional movements aren’t very rounded and tacklers seem to have a very wide range, so you really have to work to get free and break a long run. Simplistic graphics, easy controls and guidance icons/text help younger audiences find their way around the gridiron. The graphics have clipping issues (e.g. hands frequently go through chest when proud players crow about their touchdowns. The background changes from light to dark when calling plays. These changes don’t really enhance the play screens as much as unnecessarily fatigues the eyes during gameplay. Fading the background while keeping the same light would have been better. Unlike other non-Wii Backyard console games, figuring out the power up plays are easy because of text and more obvious animation. Special power move animations boost the kid friendly excitement and humor. The stonewall tackles/hits also heighten the action while having no timeouts forces players to be good clock managers and keeps the games moving at a rapid pace. Statistics move players toward higher goals on individual and team levels. This is a nice stepping stone for other NFL games, but a decent sports title on its own as well (*** out of four stars). This entry was posted in Video Game Reviews and tagged Football, Michael Siebenaler, Mike Siebenaler, NFL, Nintendo, Tall Writer, Wii. Bookmark the permalink.